The Massachusetts state seal, which displays the same image as the flag. It took the slaughter of nine innocents, but finally, in South Carolina and elsewhere in Dixie, the Confederate flag is being treated as the throwback racist banner it is. But while we’re on the subject of offensive flags, perhaps we should take a few minutes to contemplate our own. Though the Massachusetts state flag is not as overtly abhorrent as the one that flies on South Carolina’s state capital grounds, it is still pretty awful. What exactly is going on here? There’s the blue shield on the white field. And a white five-point star, signifying Massachusetts’ status as one of the first states. So far, pretty standard stuff. 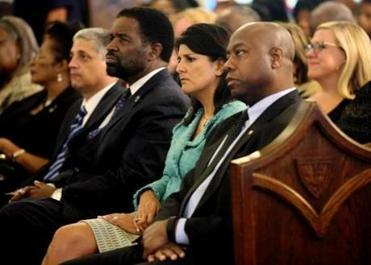 Republican presidential candidates are ready to stand up to ISIS, Iran, and Putin, but not to S.C.’s GOP primary voters. Then it gets weird. On the shield stands a Native American drawn in gold, a bow in one hand, an arrow in the other — its point turned down to signify peacefulness. Or is it surrender? It is hard to read it all together as anything but a flag designed by and for the colonial conquerors who made the Bay State, the ones who won the land — with a short time out for Thanksgiving dinner — by all but eradicating the people who got here first. Or at least it is hard to read it any other way if you are one of the descendants of those who knew the upraised sword, and then the bitter peace. Native Americans have been trying to change the flag for decades, to little effect. The motto and the sword purportedly refer not to the victory over the native peoples but to the pilgrims’ attitude toward their imperial oppressors in England. Vexillologists (the fancy word for flag scholars) and heraldry nerds will tell you the sword is related to the motto, not to the man on the shield. But that nuance long ago drained from the image, which also appears on the state seal. Yes, the Native Americans were just crying out to be conquered and converted. At the time of colonization 30,000 of them called Massachusetts home. By the end of the 17th century, fully 99 percent of them had been killed by the diseases and warfare the settlers brought with them. These were ugly years, bringing the devastating King Philip’s War, and the internment even of those Native Americans who had converted to Christianity, many of whom died of starvation and exposure while imprisoned on the Boston Harbor Islands. It is that ugly history Native Americans see when they look at the Massachusetts flag. Over the years, controversy has flared up over the state’s official images, then died down. Native Americans had bigger things to worry about — like poverty and health challenges — not to mention more current cultural irritants, like insulting team names and stupid mascots. Whenever those offended by the flag have been ready to fight, state Representative Byron Rushing has pushed for legislators to revisit the flag. “There is not so much a feeling that people want to defend it, but just a reluctance among my colleagues to change it,” said the Roxbury Democrat, who took the offensive seal off his own stationery decades ago. Rushing has long expected a group of schoolchildren to lead the charge. After all, a class from Western Massachusetts was key to getting the Mass. Pike logo changed in the late 1980s. After they brought the offensiveness of the arrow piercing the pilgrim’s hat to his attention, Rushing pushed the authority to replace it with the much friendlier and less insulting hat-by-itself. It’s time for the kids to step up again. Or for the grown-ups on Beacon Hill and beyond to take this on. Clearly, our state flag is not in the same league as the Confederate standard, the banner carried by those who fought to keep black people as slaves. 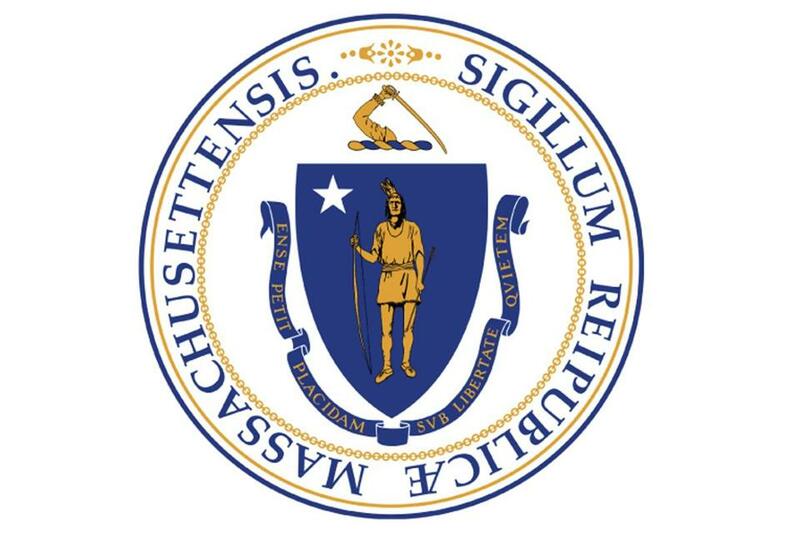 The Massachusetts state flag is more in the camp of the blindingly archaic. History has not been kind to it, each decade making it seem yet more insensitive. This state was born and has thrived in part because of Native Americans’ massive losses. Our flag ought to reflect the huge debt we owe them. And a larger sense of who we are and want to be.